Yes, they still look new. When all you do is run on the treadmill, use the elliptical, or hit the spin bike, your shoes never see the light of day, so of course they look new. What's problematic is the part you don't see. The support and function of a running shoe has little or nothing to do with the overall appearance of the upper part of the shoe or even of the sole. It's the midsole, the portion of the sole that is largely invisible from the outside, that has the most function and limits a shoe’s useful lifetime. With every stride you take, the midsole compresses and, with time, loses the majority of its support. I estimate the useful lifetime of a running shoe for runners to be approximately 350 miles. This amount may be slightly shorter for heavier runners and slightly longer for lighter ones. For those who really don't run regularly, or participate in other sports and activities that can't be measured by mileage, your shoes should be replaced every 4-6 months, depending on the frequency and level of the activity. For most of us, it’s hard to tell if our shoes are still doing their jobs properly. The more you wear your shoes, the less support and protection they offer, but, because the decline is gradual, it can be hard to tell when you have reached the threshold where your shoes could actually be causing you permanent foot damage. The good news is that you no longer have to go it alone on the guess-and-test method of sneaker replacement—Zappos and MapMyRun have teamed up to create an app called Gear Tracker that will tell you when your shoes have worn out and need to be replaced. Here’s how it works: Gear Tracker asks you to log in what type of running shoes you wear, so as you log your runs, the app can determine when it's time to buy replacement shoes. Based on the data collected, a shoe meter will indicate the health of your shoe, turning yellow and then red as it gets closer to replacement time. When your shoes’ life span is up, the app will send you a notification. At that point, you’ll be given the option to buy shoes directly through the app, courtesy of Zappos, of course. Not interested in going the electronic route? There are plenty of other ways to start keeping track of the life of your shoes. For starters, I suggest dedicating one or more pairs of shoes exclusively for exercise to get the most out of their useful lives. You can record your mileage in a running journal, or even in pen on the side of the shoe. To help you remember how old a shoe is, write the date on the tongue or the outsole, if you’d rather go by the six month marker system. Whenever you are involved in serious exercise, minor injuries are inevitable. You must do everything in your power to minimize them. 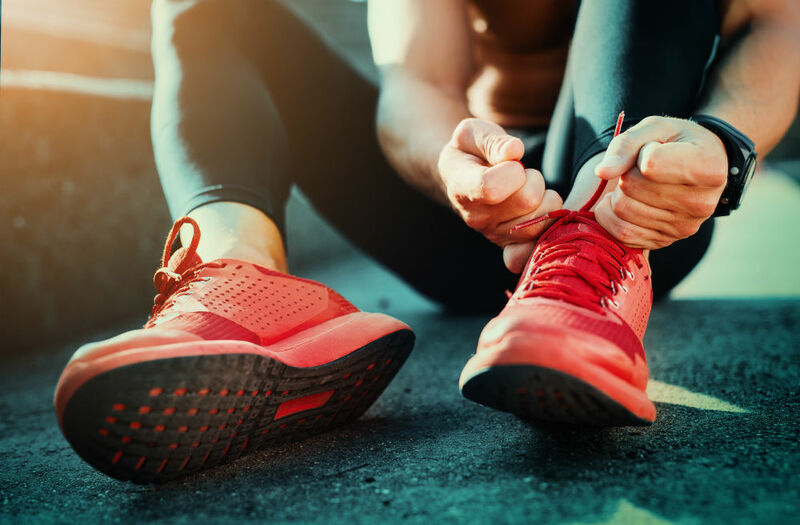 Just wearing the proper shoes is one simple way to help you along—after all, worn out shoes have been linked to poor running performances, not to mention overuse running injuries like shin splints or stress fractures. Since wearing shoes that have lost their ability to protect your feet can be so damaging, I think an app like Gear Tracker is a great addition to the arsenal of tools we can use to fight running injuries. But barring this kind of download, I highly encourage you to roughly track the miles you’ve logged in your kicks. Or, at the very least, use some common sense and toss out those hole-ridden crusty old sneakers from your college days!